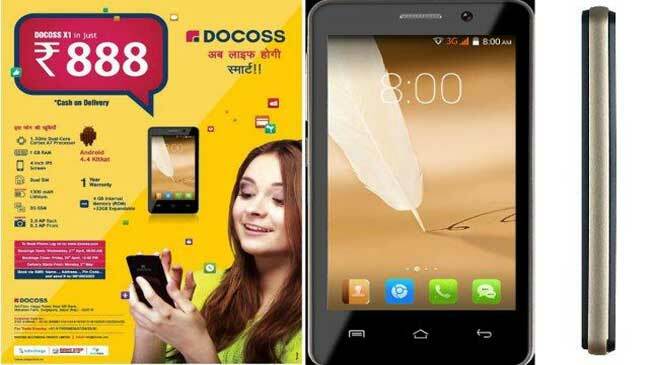 Once again the Mobile phone industry is shaking with the launch of a smartphone called Docoss X1 at a price of just Rs 888. The company is taking orders via its website- www.docoss.com- and hotline number-9616003322. The booking is available till April 29, 10 PM. The company is offering cash on delivery option and promises to start delivery from May 2. Earlier last month we had seen a similar news in this industry where a new brand out of nowhere announced a Smartphone at Rs 251. Ultimately they have been accused and also legal steps taken against that brand under multiple issues. However, be cautious before booking the phone as the company was never heard before. At the time of writing, the website was not properly working anyway. But at Rs 888, the phone definitely offers more than you could bargain for. So in our view, book it if you want but opt for cash on delivery just to be on the safer side. 3G connectivity, 2 MP rear camera and a 0.3 megapixel front camera. This is a Jaipur based company while the domain name was registered two months back and it’s a private registration which means that there’s no information published about the domain owner, adding more doubts. The brand’s name, “DOCOSS Multimedia Private Limited,” as per the information, they are listed as a Smartphone seller company.